Today we celebrate an author and illustrator that is the BEE'S KNEES. Your children will be begging, "More bat books, PLEASE!" Reading through a stack of his books will be a BREEZE. I no longer want to TEASE. Because his books are nothing to SNEEZE.... at, so here we go. Brian Lies is the illustrator of over 25 books for children including Bats at the Beach, Finklehopper Frog by Irene Livingston, and More by I.C. Springman. 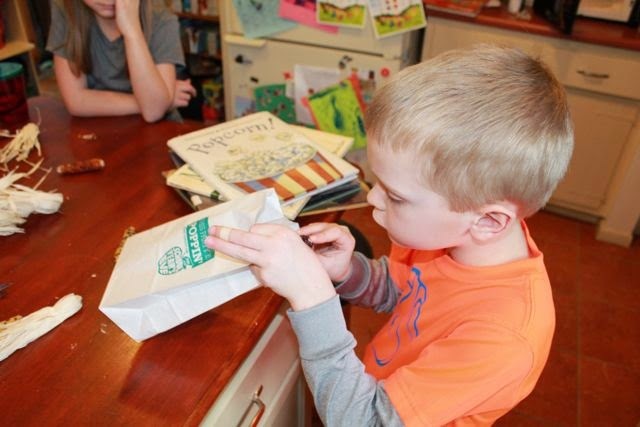 When Brian Lies was in the fifth grade he became intrigued with the idea of writing, drawing, and telling stories for living when a real author visited his school. After the author visit he knew, "That's what I want to do." However, when it came time to go to college he decided to study Psychology and British and American Literature instead. (National Book Festival). While in college, the creative spark that was ignited in the fifth grade grew a little stronger when Brian started drawing political illustrations for the college newspaper. After receiving rejection letters from 140 daily newspapers he realized that he should go to art school to hone his craft. He went to the School of the Museum of Fine Arts in Boston and while at school he got his chance to do illustrations for larger publications including The Boston Globe and Christian Science Monitor. (Seven Impossible Things Blog). 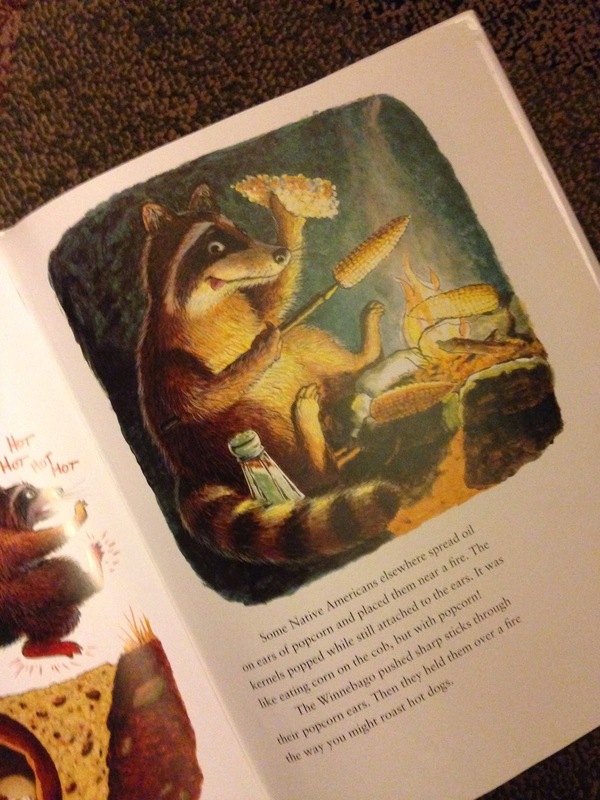 The jump from editorial illustration to children's book illustration happened one day when he was at the store. An art director from Houghton Mifflin overheard him talking about being an illustrator and within two months of their meeting Brian received his first manuscript to illustrate; Flatfoot Fox and the Case of the Missing Eye by Eth Clifford (Teachingbooks.net). The success of his first book led to more Flatfoot Fox books, his own Hamlet books, and many more. Bats at the Beach, Brian Lies' 19th book, became a huge hit when it was published in 2006. A book that, according to Brian, really happened as an "accident." One cold morning before school, his daughter, who was in the second grade, noticed frost on a window in their house. She said that the frost looked like "a bat in sea foam." After getting his daughter on the bus, Brian started thinking that a story about bats at the ocean could work and he was right! In his National Book Festival presentation, Brian said, "My favorite animal is not a bat. My favorite animal is the armadillo and I have not yet done an armadillo book." There hasn't been an armadillo book by Brian Lies but there is no need to worry because there are four bat books to enjoy. The latest is Bats in the Band which was published in August 2014. Our family had the chance to meet Brian Lies at the National Book Festival in Washington D.C. In the picture below he is signing our copy of More by I.C. Springman. We love this book! 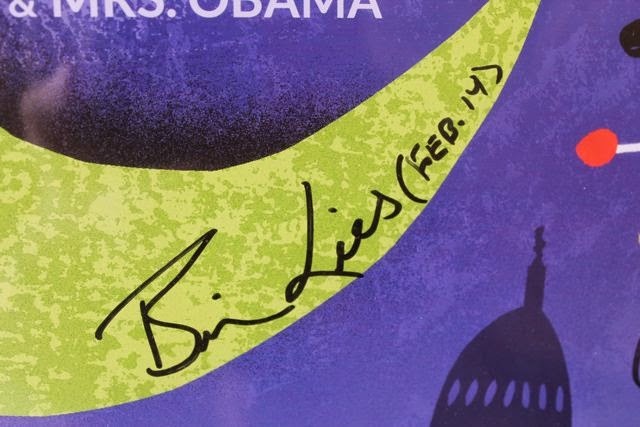 Brian Lies signed our poster and shared his birthday with us! I went to our local library to fill my bag full of books by Brian Lies. 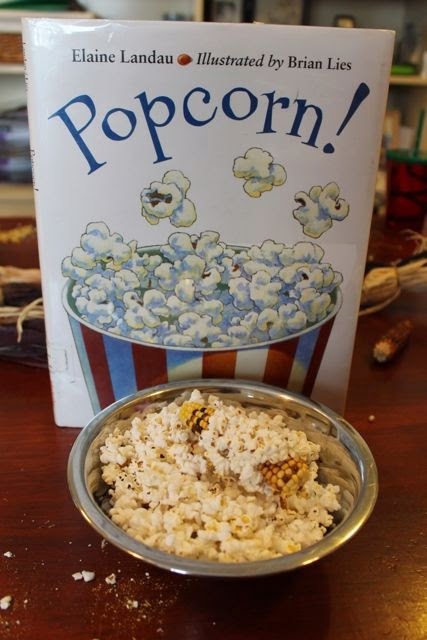 I found the book Popcorn! by Elaine Landau which he illustrated. I immediately had a craving to read this book with my children while munching buttery popcorn. 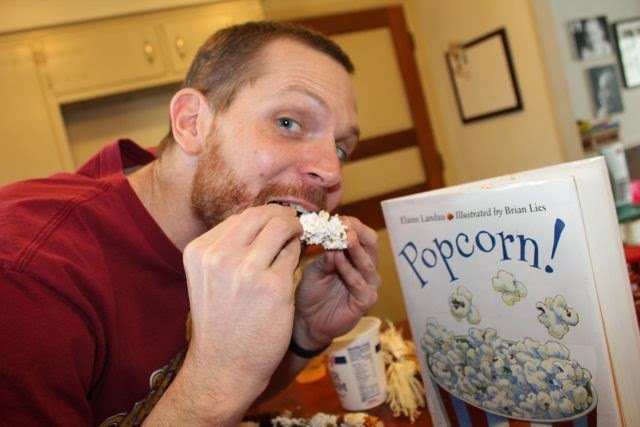 When I saw this illustration by Brian Lies in Popcorn! 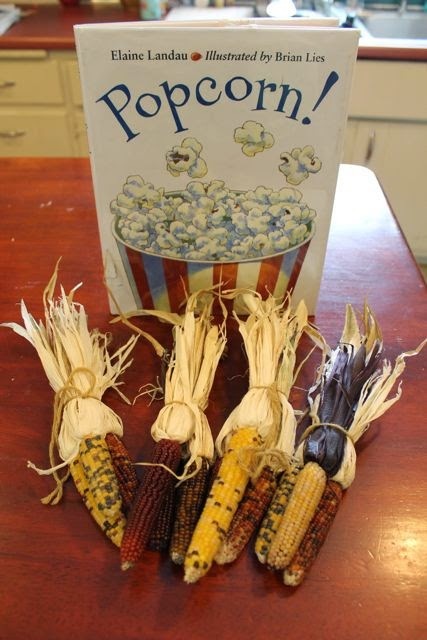 it reminded me of the popcorn that my grandfather grew in his garden. 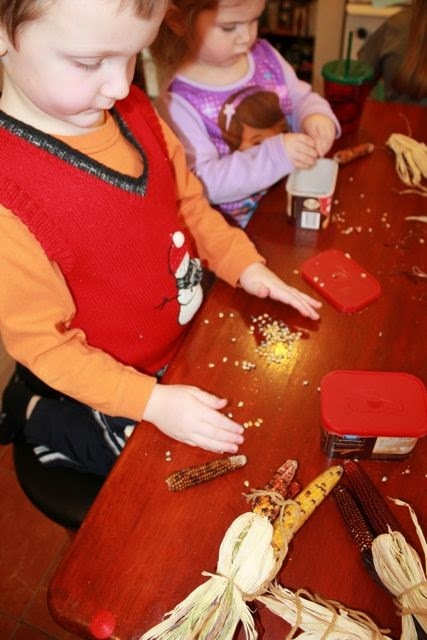 He had given us many ears of popcorn to decorate our dining room table at Thanksgiving. 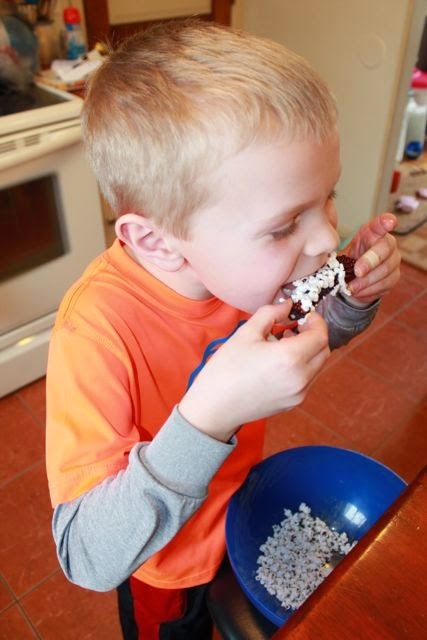 He told us that when Thanksgiving was over we could enjoy it as a snack. I had forgotten all about the popcorn and I thought popping it would be the perfect way to celebrate Brian Lies' birthday. I took this picture before I read the book to my children. When I was taking this picture I was thinking, "There is no way this is going to pop." My apprehension led me to call my grandmother and ask more about the popcorn. 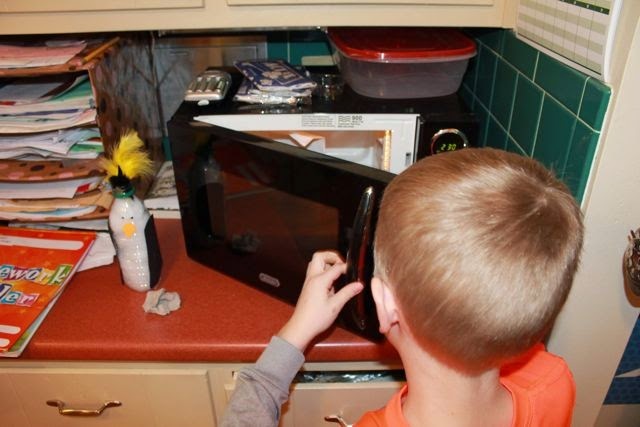 She advised putting the popcorn in a paper bag and microwaving it for around 2 minutes. 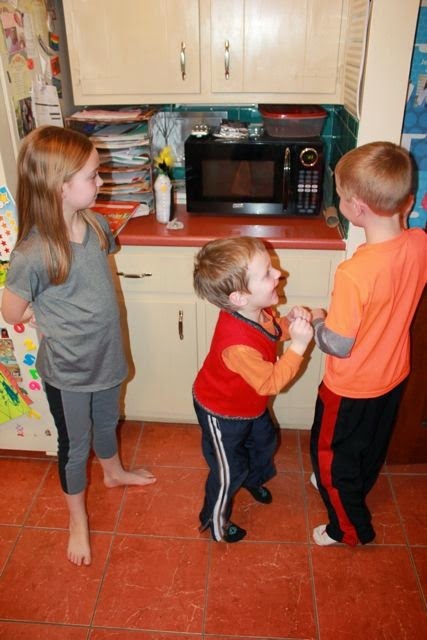 I thought it was worth a try and if it didn't work I had microwave popcorn in the pantry to feed my hungry popcorn lovers! As I read Popcorn! 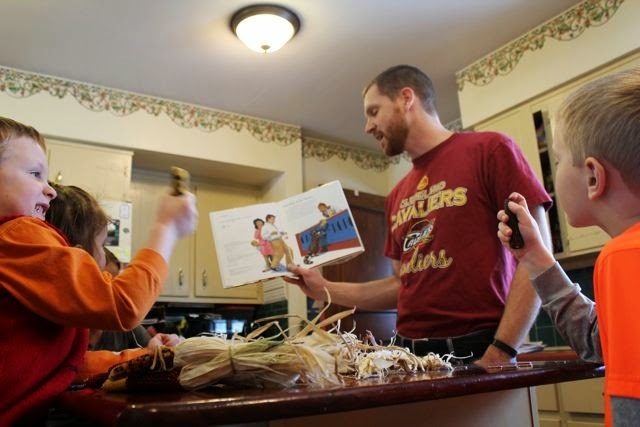 my children listened while they played with the ears of corn. We loved this non-fiction book. 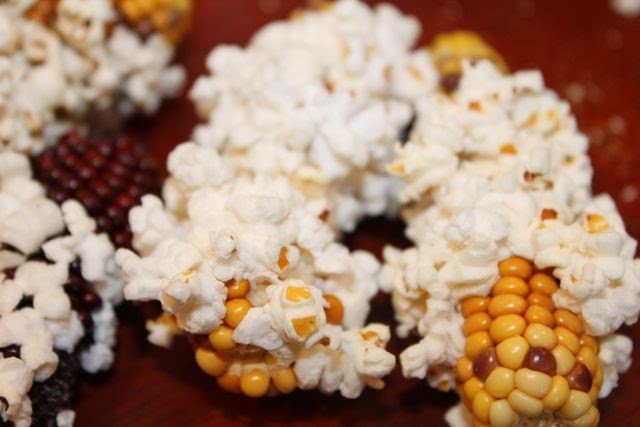 We learned where popcorn grows, what makes it pop, and the history behind our favorite snack. My youngest son is a gardener just like his great-grandfather. 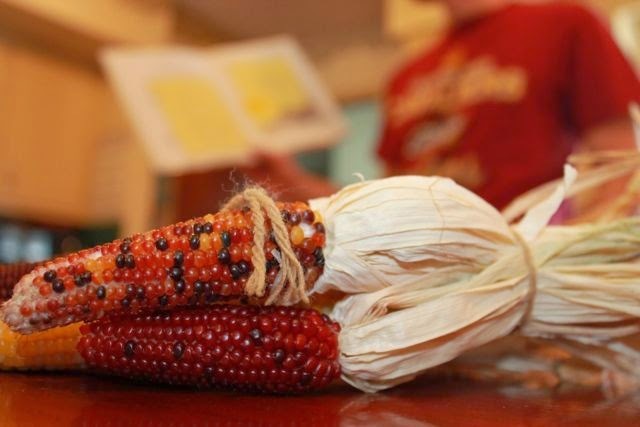 He saved these kernels for next spring. 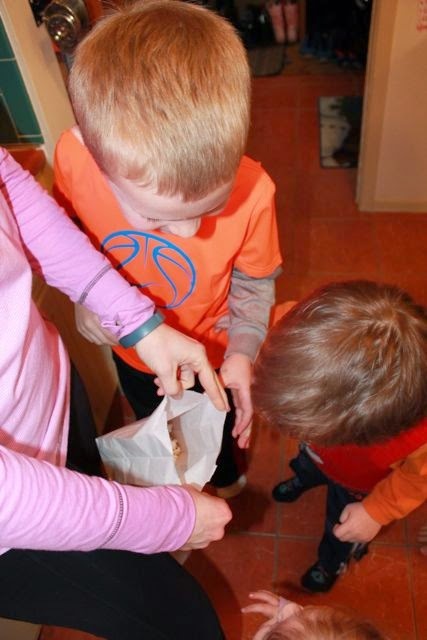 My oldest son placed one of the ears of popcorn in a paper bag. Some of the popcorn was still attached to the cob. 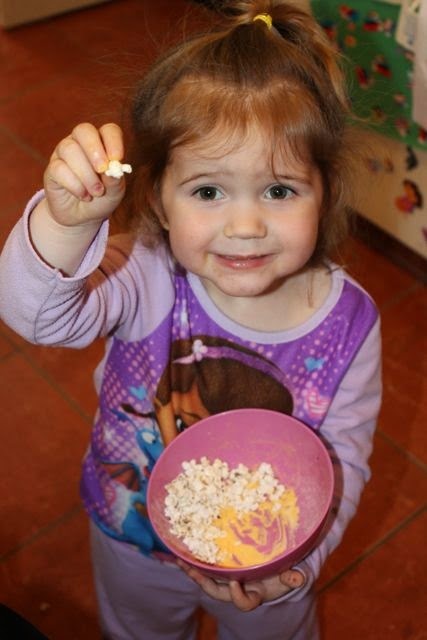 All this popcorn came from one of those little ears! This was a memorable experience; eating popcorn right off the cob! My youngest daughter picked the next ear to pop. "Look! 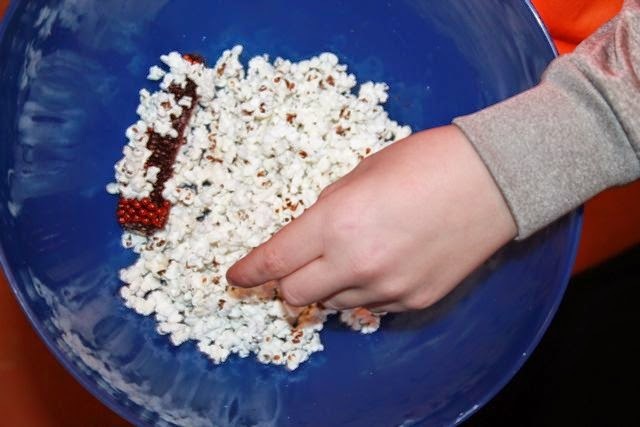 I sprinkled lots of seasoning on my popcorn." 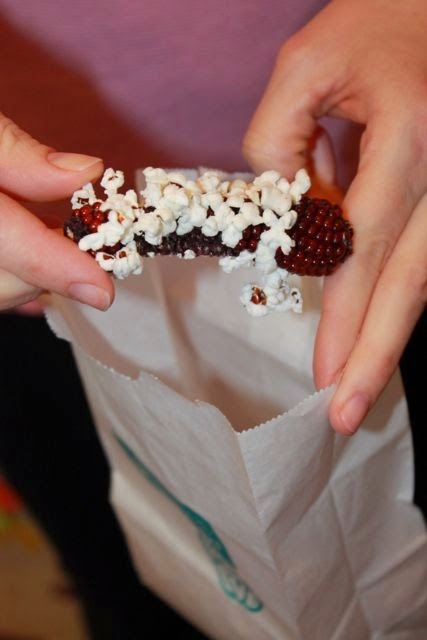 I was shocked at how delicious this popcorn was. Yum! I am always amazed that things seem to work out for our author birthday celebrations. I hope we did not DISPLEASE with this birthday celebration for Brian LIES! I know you will love his books. Check them out! The next book from Brian Lies is Malcolm Under the Stars by W.H. Beck. It is scheduled to be released August 2015, but available for pre-order today!